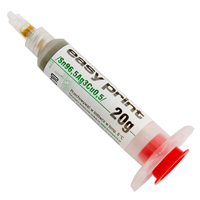 EASY PRINT Sn62/Pb36/Ag2 20g A "No Clean" type paste is designed for soldering SMD components in production processes that do not include washing phase. 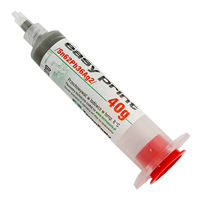 EASY PRINT Sn62/Pb36/Ag2 40g A "No Clean" type paste is designed for soldering SMD components in production processes that do not include washing phase. 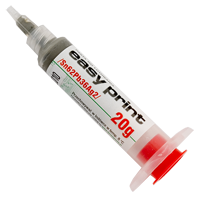 EASY PRINT Sn62/Pb36/Ag2 8g A "No Clean" type paste is designed for soldering SMD components in production processes that do not include washing phase. 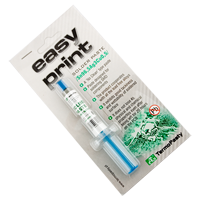 EASY PRINT Sn96,5/Ag3/Cu0,5 20gPaste designed for soldering SMD components in production process that do not include washing phase. It is based on a "no clean" flux type, that does not require cleaning and residues do not cause corrosion centres. 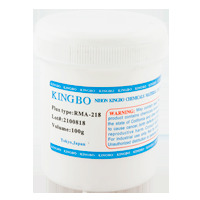 The product cooperates with all the lead free alloys, it exhibits good tackiness and chemical properties even after being left for 20 hours on the PCB. This time depends on conditions in room: humaidity and temperature. 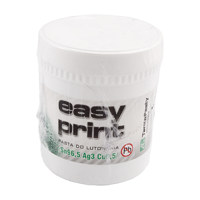 EASY PRINT Sn96,5/Ag3/Cu0,5 28gPaste designed for soldering SMD components in production process that do not include washing phase. It is based on a "no clean" flux type, that does not require cleaning and residues do not cause corrosion centres. The product cooperates with all the lead free alloys, it exhibits good tackiness and chemical properties even after being left for 20 hours on the PCB. This time depends on conditions in room: humaidity and temperature. 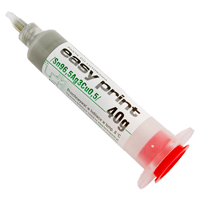 EASY PRINT Sn96,5/Ag3/Cu0,5 40gPaste designed for soldering SMD components in production process that do not include washing phase. It is based on a "no clean" flux type, that does not require cleaning and residues do not cause corrosion centres. The product cooperates with all the lead free alloys, it exhibits good tackiness and chemical properties even after being left for 20 hours on the PCB. This time depends on conditions in room: humaidity and temperature. 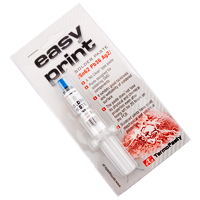 EASY PRINT Sn96,5/Ag3/Cu0,5 500gPaste designed for soldering SMD components in production process that do not include washing phase. It is based on a "no clean" flux type, that does not require cleaning and residues do not cause corrosion centres. 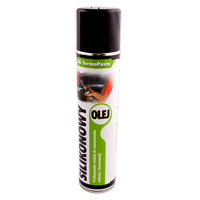 The product cooperates with all the lead free alloys, it exhibits good tackiness and chemical properties even after being left for 20 hours on the PCB. This time depends on conditions in room: humaidity and temperature. 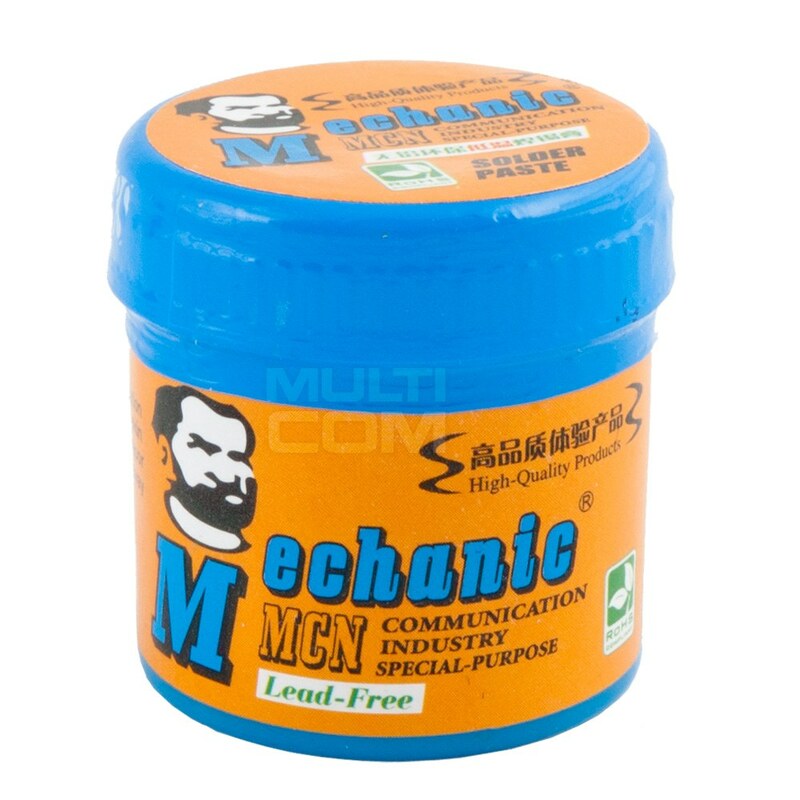 Low-Melting solder paste Mechanics MCN B80-BS458 - Sn42/Bi58- 60g is a special type of low melting solder paste (tin in the form of paste) designed for soldering SMD / BGA elements in repair processes / data recovery. Thanks to a very low melting point of 138C, it enables complex repairs (eg, inserting a CPU in the iPhone) without exposing the other components of the phone to damage. 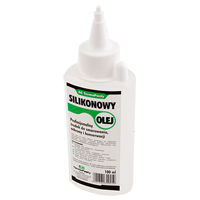 Low-Melting solder paste Mechanics MCN WQ80 - Sn42 / Bi58 + PB- 40g is a special type of low melting solder paste (tin in the form of paste) designed for soldering SMD / BGA elements in repair processes / data recovery. Thanks to a very low melting point of 138C, it enables complex repairs (eg, inserting a CPU in the iPhone) without exposing the other components of the phone to damage. 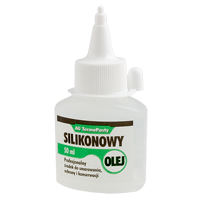 Solder paste AP-10, SN62, 35g it's special paste that will help you to solder SMD, BGA chipset or even SMT elements.